Born Jan 21 18957,8,9 [Jan - 189410], West Virginia7,8,9. He married Glenna Ester Friend1,11 [Glana Friend7], Apr 19 19161,11. Glenna, daughter of Marshal Clark Friend & Jerushia Adeline Rogers1,7,12, was born Aug 7 18931,7,12 [about 18973]. 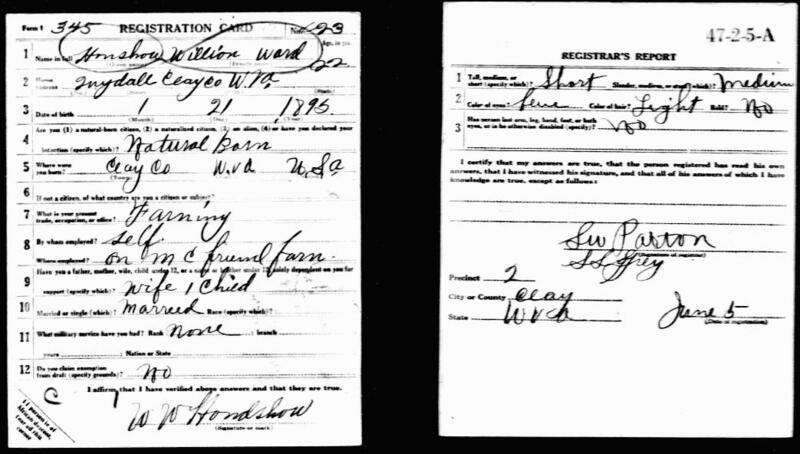 Friend, Marshall, head-of-household, age 64, born in West Virginia; parents born in West Virginia; first married at age 20; owned home; occupation: farmer, general farm; not a veteran. Friend, Gerushia, wife, age 50 [unclear], born in West Virginia; parents born in West Virginia; first married at age 15. Friend, Neuron, son, age 24, born in West Virginia; parents born in West Virginia; single; occupation: farmer, general farm; not a veteran. Hanshaw, Glenna, daughter, age 33, born in West Virginia; parents born in West Virginia; divorced; occupation: servant, private home. Hanshaw, Alonzo, grandson, age 13, born in West Virginia; parents born in West Virginia; attended school. Hanshaw, Leo, grandson, age 11, born in West Virginia; parents born in West Virginia; attended school. Hanshaw, Blanch, granddaughter, age 9, born in West Virginia; parents born in West Virginia; attended school. Hanshaw, Arnold, grandson, age 7, born in West Virginia; parents born in West Virginia; attended school. Glenna's obituary was published in the "Charleston Daily Mail" (Charleston, West Virginia) on Thursday, March 13, 197513 (see obituary scan below). 1930 census, Henry District, Clay County, West Virginia; roll T626-2530, ED 4, page 15A, line #9, dwelling #258, family #258. Obituary of Glenna Ester (Friend) Hanshaw. Obituary of Glenna Ester (Friend) Hanshaw; courtesy of (private) Hanshaw.